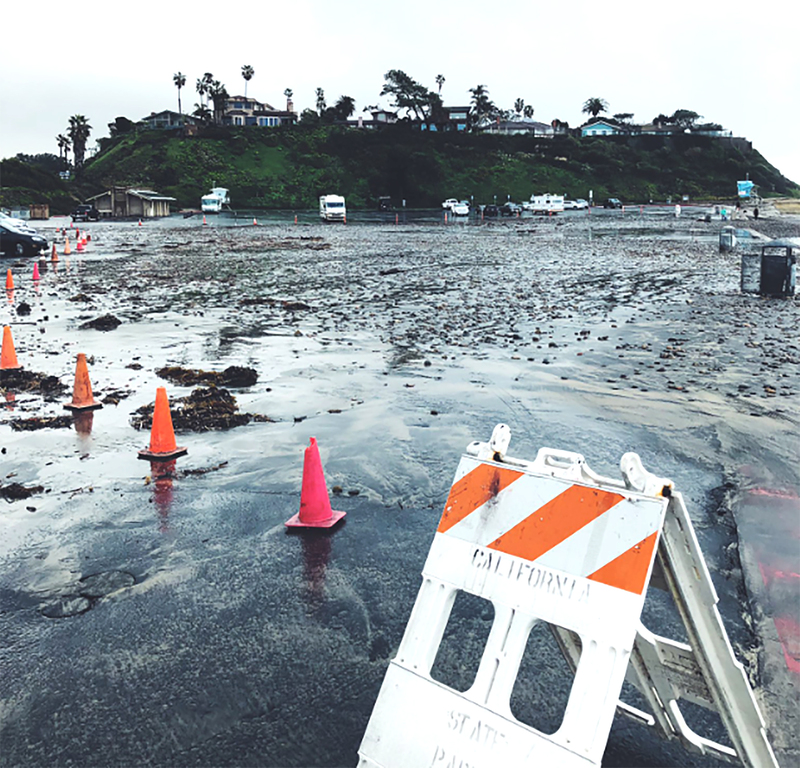 REGION — The last in a series of Southern California storms kept the San Diego area blustery and rainy once again today, further drenching the already saturated region. By late afternoon, the four-day wet spell had delivered anywhere from half an inch to half a foot of moisture across the county, according to the National Weather Service. Rainbow Camp; 2.5 in Pine Hills; 2.33 in San Onofre; 2.27 in Santa Ysabel and at Skyline Ranch; 2.15 in Descanso; and 2.08 on Mount Woodson. Other 96-hour moisture totals included 1.98 inches in Warner Springs; 1.87 in Oceanside; 1.76 in Deer Springs and Oak Grove; 1.75 in Escondido and Pine Valley; 1.68 in Bonsall; 1.63 in Valley Center; 1.62 in Santee; 1.37 in Barona; 1.3 in Encinitas; 1.28 in Flinn Springs; 1.23 in Ranchita; 1.22 in Carlsbad, Rancho Bernardo and Rincon Springs; 1.18 in Harbison Canyon; 1.11 in Kearny Mesa; 1.06 in Campo and La Mesa; 1.04 in Poway; 0.93 in Solana Beach; 0.92 in Granite Hills; 0.87 in San Felipe; 0.79 in Mission Valley; 0.7 at Lindbergh Field; 0.64 in Borrego Springs; 0.63 in San Ysidro; 0.62 in Agua Caliente; and 0,52 in Ocotillo Wells. The storms brought some snow flurries to the county’s highest peaks, including Mount Laguna, where two inches of the frozen white stuff was recorded. Wind and high-surf advisories were scheduled to remain in effect locally through 7 a.m. Friday and 4 a.m. Saturday, respectively. The showers will taper off tonight before the unsettled weather pattern moves out of the area to the east on Friday, making way for fair and warmer conditions through next week, according to forecasters.